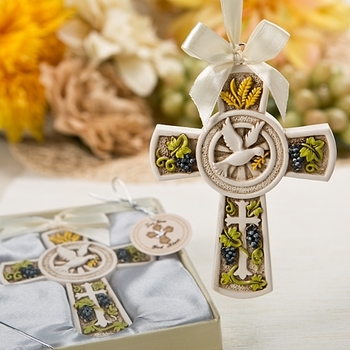 Our Blessed Cross Ornament Favor is a unique and thoughtful way to thank your guests for attending your baby’s Baptism, Christening or other religious event! They can display this lovely ornament as an inspired reminder of your special day. Each ornament is cast from durable poly resin and measures 4 1/2 inches tall by 3 3/8 inches wide. Once cast, each is then hand painted in striking detail to highlight the grapes, vines and grains surrounding the dove of peace in the center of the cross. Minimum order is 18 and shipping is free. Presented in a clear topped beige gift box on top of silver satin staging, each ornament is tied with a silver ribbon and finished with a matching tag that reads ‘For You’. Please note: The ‘For You’ tag pictured in the photo is pre-printed. Custom Personalized Tags or Stickers can be added to your order ($.35 each) if you would prefer to include a personal note of your own design!